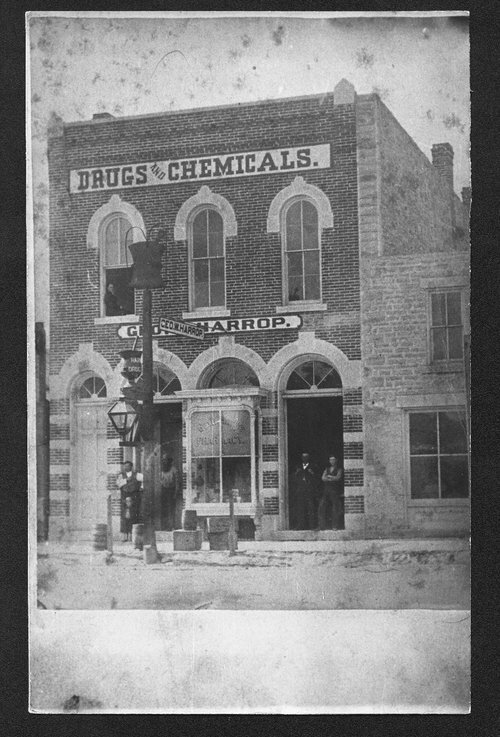 These photographs show views of the George W. Harrop Drugs and Chemicals store located at 215 Poyntz Avenue in Manhattan, Kansas. The first photograph shows an exterior view of the store with a few men and a small child visible in front of the store. There is also someone partially visible sitting in the open window on the upper left side of the building. The lamp post at the edge of the street has the traditional mortar and pestle pharmacy symbol in two places: half-way up the post just above the lamp, and also at the top of the post. The second photograph shows an interior view of the pharmacy with three men standing in the store and several display cases and shelves full of bottled chemicals and pharmaceutical materials. Holding Institution: Manhattan Chamber of Commerce. Woman's Kansas Day Club, 1951.